Do Baby Boomers prefer to use internet browsers instead of their smartphones to look up information? Do Millennials want to receive more information via Twitter than any other source? Social Media Today recently published an article that lays out the answers to these and other questions about how different generations consume online content – down to the difference in time of day usage. 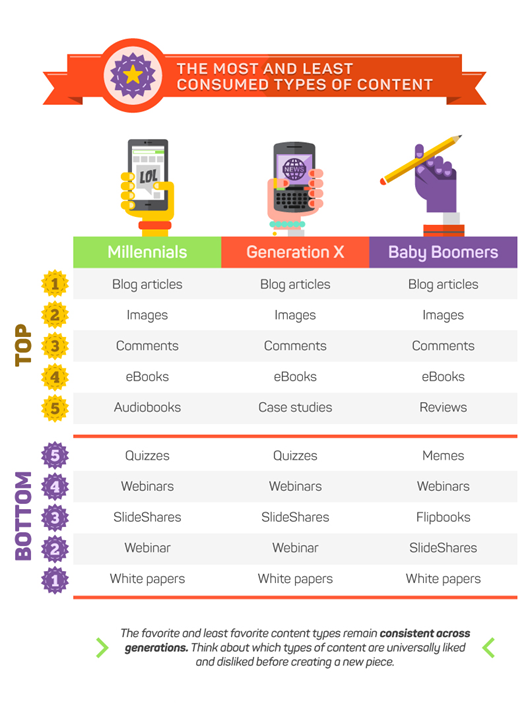 The infographics in the post help to visually describe some of the gaps that exist between the different generations. However, with all of the differences that do indeed exist, one thing was constant: the “sweet spot” for word length looked to be 300 words… not a word more. Click the image below to go to the full post and view the entire infographic. The PEW Research Center recently updated their social media use survey results, which are very useful in determining which social media platforms to use depending on your audience and topic. Despite assumptions that youth aren’t using Facebook, the study proved that to be wrong. Facebook is still way ahead of all other social media platforms in terms of usage. Other insights and info are in the full report. How might this information change how you currently use social media to reach online audiences? Posted by Jamie at 8:50am May 20, 2015 Posted in Social Media, Tech Strategy and tagged Best Practices, education, Handy Tools, Program Planning, Social Media, Strategy, Technology. Bookmark the permalink. ← Formal vs Informal Learning Environments: Moodle or Blog?